Gardening is about enjoying things growing in the soil, getting dirty without feeling guilty, and generally taking the time to soak up a little peace and serenity. It's mid-summer and for many, the garden is in full swing. Few endeavors can match the self- satisfaction having a healthy garden can provide. Gardening is a three-way win that positively affects the body, mind and spirit. One could rightfully add a fourth win if including the harvest. Planning which vegetables you intend to grow and mapping out your garden keeps the mind active and in tune with the task at hand. Keeping up with the garden through the physicality of prepping, planting and maintaining, is great cardio and it gets you out into the sunshine and fresh air. Gardening also brings with it a nearly indescribable quiescence and peace that allows one to escape, if even for a while, the daily grind that comes with just living. While vegetable gardens are great to have, this Organic Daily Post article will focus on tomatoes. Not what kinds or how to grow them, (you'll find lots of articles about that on this site) but how to preserve the seeds from your favorite brands in order to grow the exact same delicious tomatoes next season. How many times while enjoying some delicious tomato you or a generous friend has grown have you lamented; These are so delicious, I wish I could grow these very same tomatoes next year? Well, the good news is, you can. By correctly preserving your tomato seeds you can enjoy your favorite tomatoes year after year. Some vegetable seeds you can just gather from the fruit and let dry. Tomatoes seeds are a bit more tricky and require a process to ensure you preserve them in the right way. This drying discipline will guarantee you grow the same great tasting tomatoes in your garden next year and for years after that. One of the first steps to properly saving tomato seeds is choosing the right seeds. You want to harvest the seeds from only the healthiest fruit. Essentially, you'll want to save seeds from those tomatoes that have the most flavor and have proven more disease and insect resistant. You should take seeds from only the healthiest and very best tasting tomatoes in order to pass those genes along. The best of the best. Additionally, save only seeds from OP (open pollinated) tomatoes. Open pollinated is a horticultural term used to describe seeds that reproduce naturally on their own and produce the same fruit year after year or seeds that breed true. This includes all heirloom tomatoes. To be labeled an heirloom, a tomato must be established for at least 100 years. The reason tomato seeds require a bit of preparation is that they come encased in a gel-like sac containing growth inhibitors which prevent the seeds from sprouting inside the tomato. In nature, this casing is removed when the fruit rots on the vine or falls to the ground and fermentation occurs. Once that happens, the seed becomes viable for planting. Fortunately, we don't have to wait for Mother Nature to do her thing, there is a short cut we can take that speeds up the entire process. Take your best tomato and slice it in two. Cut as if the tomato were wearing a belt. Cut right through it. This exposes more seeds than if cut up and down. Next, using a spoon, scoop out the seeds. 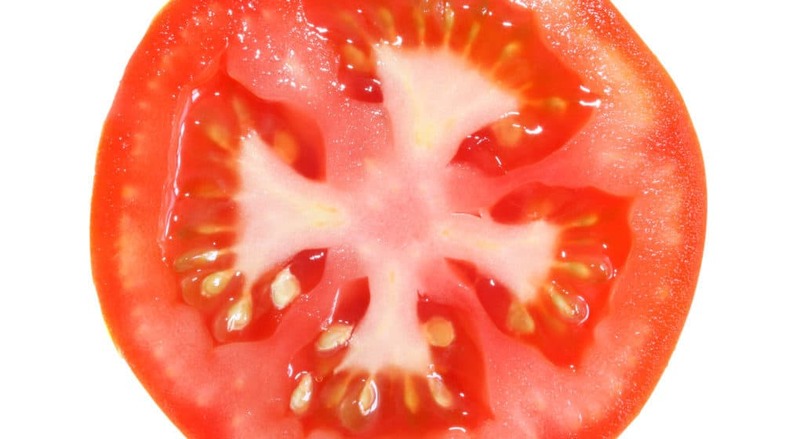 Often, some of the flesh of the tomato comes out with the seeds but no matter as they are going to be separated anyway. Place the seeds into a clean bowl or clear jar. Glass jars used in canning work nicely. We recommend jars over bowls because it takes a few days for the fermentation process to work and during that period it can get rather stinky. With a jar you can put a lid on it. Some methods call for adding a little water to the seeds and pulp but by by diluting the acidic tomato juice you retard the fermentation process. If de-seeding more than one kind of tomato, be sure to label your jars to avoid confusion later. Store the jars in a cool and dark place. Optimally, you want the temperature to be around 70 degrees Fahrenheit (21 Celsius) but as long as it is cool and dark the process will work. It just may take a day longer. There are two schools of thought here on the fermentation process. One method suggests leaving the seeds and juice alone for two or three days. Mold will begin to form on top. This mold is harmless to the seeds although it may discolor them according to some accounts. The other method consists of stirring the pulp and seeds twice a day to prevent mold from forming. It's your call however. Both produce the same result. After three days the gel-sac should be loosed enough to begin the next step. Now it's time to decant. Decanting consists of merely pouring the fermented mixture into a larger container whereby you can add two to three times the amount of water to it. This makes it easier to pour off the pulpy water while keeping the seeds. Usually, the viable seeds are heavier and will sink to the bottom. Keep filling the container with water and pouring it off until the seeds are cleansed and rest in the bottom of your bowl (or whatever you used). Next, place the cleaned seeds into a sieve or on a screen and rinse with clean water to remove any remaining pulp. You may need to use your fingers to pluck off some of the more adhesive pulp. Tomato seeds can be somewhat sticky so if you're going to dry them on a screen use the spraying water to spread them out. After rinsing the seeds clean, give the strainer a little shake to remove any excess water. You can also wipe the bottom of the strainer or sieve. Once they are free from excess moisture turn the sieve over and tap the seeds onto a paper plate or drying screen. Allow the seeds to dry for about a week in a well ventilated area. The seeds will have a tendency to stick together so once or twice a day pick them up and and kind of crumble them in your hands to separate them from each other. They dry faster that way and this also helps to prevent mold from potentially growing on them. They store best in a canning jar or any airtight container. Label them and store in a cool, dark place. Tomato seeds prepared and stored in this way can be viable (still good) up to five years or longer. While you can place them in the refrigerator it isn't necessary. You do not want to freeze them, however. The ways of nature are many and wondrous and we become a part of that wonder with each seed we plant; setting into motion the miracle of life.